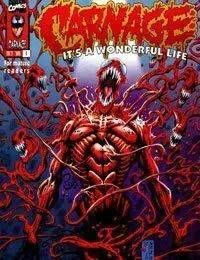 Carnage manages to get John Jameson and Dr. Kofka into his mind and tries to teach them that the world has and always will be based on carnage. Kasady even says in one of the pages where the time is always war-time somewhere. And all that measures in the end is well... THE BODY COUNT! When he said this he made the background turn to all blood thirsty warriors.